To Japan, where Kyoto Mayor Ryozo Tatami is addressing a crowd from the sumo ring. Lumme! He’s only gone and keeled over. It looks a lot like a subarachnoid hemorrhage. People dash to help. A woman administers CPR. But hold on. The sumo announcer has hold of the mic. “Ladies, please leave the dojo,” he orders. Better that the man die than some female sully the sacred canvas. 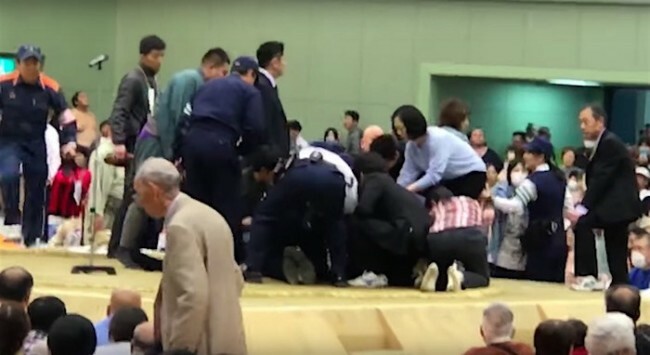 At least two women climbed into the dohyo and administered cardiac massage to Tatami. During the emergency, the women were ordered to leave at least three times in announcements made over the public address system. The gyoji also said, “Gentlemen, please climb up (to the dohyo),” according to municipal government sources and others. The Japan Sumo Association chairman says the referee failed to understand the rule about human life being more sacred than a roped-off mat, offering: We would like to offer a profound apology. This instruction was inappropriate under such life-and-death circumstances. The gyoji did it because he was upset.” Yeah, by the presence of a woman. The mayor is now “conscious and talking”. The rest of us are speechless.